Weather is more pleasant – higher survivability rate. Pups will have grown and learned how to hunt prior to a more difficult winter. You will be more likely to take a pup out to socialize them. Pup will experience thunderstorms in their socialization period. Whatever a puppy has a good experience with they will tend to like later on. Whatever a puppy has a bad experience with they will tend to dislike later on. Whatever a puppy has no experience with they will tend to dislike later on. People spoiling the dogs which in turn makes them think they are a higher ranking pack member and can control the rest of the Pack and strangers through aggression. Here is a really good thing to keep in mind for training a dog: Once a dog understands their commands and obedience, everything else is considered a distraction. I could say my dog will sit in the house but will my dog sit with 100 rabbits running around? It is the exact same behaviour the only difference is the distractions have changed. If your puppy does not see anything else as a distraction then your training will be a piece of cake. This is why proper socialization is so extremely important. One key thing I will do with a puppy is take them to all different kinds of distractions and make them do Sits & Downs for their kibble. This is a very easy step to socialize a puppy properly and can make your training later on 1000 times easier and that is no exaggeration. What are the cons of taking a puppy out early for socialization? A puppy is a lot more susceptible to contracting Parvo Virus prior to having all of their vaccinations up to date. This is the single biggest factor in why puppies do not get proper socialization. People are afraid to take their puppy out until they have full vaccination. I myself feel that it is very well worth the risk of taking a puppy out so that they can be properly socialized. You must take as many precautions as possible. Avoid areas with other dogs and especially avoid other dogs feces. You could be a very cautious person and only let your dog in your own backyard to avoid Parvo. However a bird could easily eat the feces of an infected dog with Parvo and fly into your own backyard and eat food out of your dog’s food dish or infect something else your puppy may get into. This would be an extremely rare case but it still could happen. Let me tell you a couple of stories relating to improper socialization. The first story is the worst I have come across. This lady had a Weimaraner puppy and was so fearful of her dog contracting any diseases that she did not take her puppy out anywhere until he was fully vaccinated and she did not even allow guests over for fear of them bringing in a disease on their footwear. This dog became extremely reactive to people and other dogs with severe aggression. No one else other than this lady could get anywhere near her dog. There was no way she could go on holidays and have someone else look after the dog. Going for a walk was a complete nightmare and dangerous to anyone else around. I have worked with several dogs that were a breeding dog and located on a breeders farm. Those dogs were perfectly accustomed to people coming over and the sounds from the farm. Some of these dogs then go to homes in the city at 2 years of age. Many are very fearful of everything around them. When I am working with a puppy I socialize them to everything I can think of in a positive way including: farm animals, car washes, vehicles, buses, construction equipment, air craft, dogs, cats, things blowing in the wind, gun fire, people, etc. Here is a very common problem I hear about with puppies over and over again when it comes to socialization. Many people think you need to socialize your puppy to as many other dogs as possible to have a very well socialized dog. Let me clarify this and pay very close attention to what I am about to say. It is important to socialize your puppy around other good dogs that you know and trust. Having your puppy get mauled by another aggressive dog can cause major problems. Do not trust another persons word that their dog is friendly! I have heard and witnessed many cases where other people say “Do you want to let our dogs greet? Mine is friendly.” Only to then have their dog attack the puppy. You do not know what another person’s definition of friendly is. One time several years ago I was walking our dog Enzo on a trail and a person approaching said “Is your dog friendly?” I said “Yes he is.” He said, “Mine too, do you want to let them greet?” His dog had a muzzle on and was snarling and lunging at my dog. I am not sure what his definition of friendly was but it was not the same as my definition of friendly. I tell people to assume that all other dogs are aggressive or improperly behaved until they have proven to you otherwise. Again Do Not take another person’s word for their dog’s behaviour. It is always the Alpha that greets others first. If you want to be the Pack Leader then you need to greet that other dog first. Proper dog greeting involves curving where they curve towards each other and then sniff. On a sidewalk or pathway you usually do not have the room to do this. When dogs are on leash they will tend to pull to go and see the other dog which puts their body language forward and makes them look aggressive which can trigger fights. All it takes to properly socialize a puppy to other dogs is to have other dogs present while your puppy is focusing on you and ignoring those other dogs. They do not need to go run and wrestle with another dog to become properly socialized to other dogs. 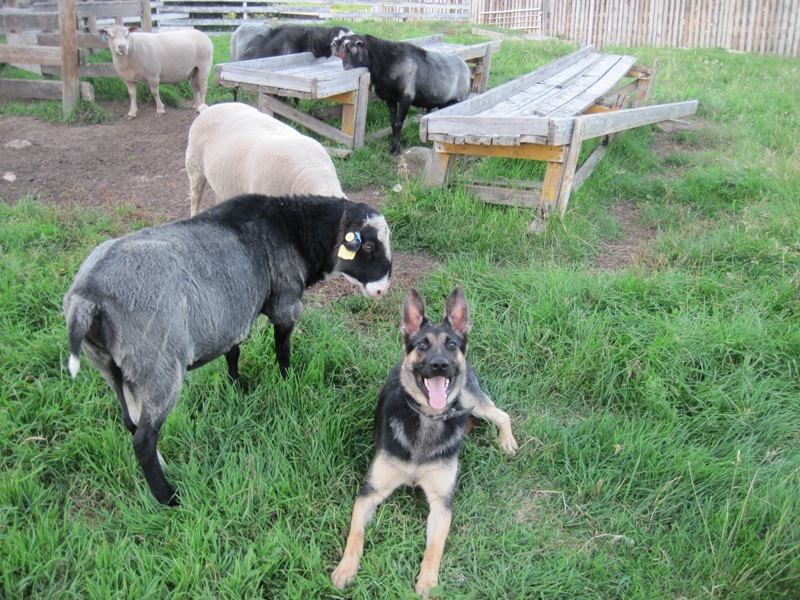 Here is a better example of what I mean: When I was socializing Delta (our German Shepherd) to our sheep, I would bring Delta into the sheep pen and make her do commands with the sheep nearby. We did this over and over and now she is excellent with the sheep. She never had to run and bark or nip at them to become socialized to sheep. All that needed to happen was to have the sheep present while Delta was focusing on me. The same can be done with other good dogs or anything else you want to socialize your dog to. Spring is a good time to get a puppy as it is much easier to work with them in warm weather and socialize them properly. In my opinion taking a puppy out to socialize them prior to full vaccination and risk of contracting Parvo Virus is worth it hands down. You still must maintain caution. Stay away from areas frequented by other dogs. Stay away from dog feces. Only bring your puppy around other dogs you trust and you know are fully vaccinated. Socialization (Proper) is the biggest key to success. Obedience is a piece of cake to train. A well socialized dog makes all the difference in your training success. All it takes to socialize a dog properly is to have the distraction present while your dog focuses on you. That’s it, that’s all. Having dogs greet on leash (WRONG). Dog parks are necessary to socialize your dog properly (WRONG). Someday it will be common knowledge to do all of these steps properly. I am making that one of my main goals in life. The more people you can tell about this the better. There is a saying in dog training “An ounce of prevention is worth a pound of cure.” I do not find this to be true at all. It is more accurate to say “An ounce of prevention is worth 10,000 pounds of cure.” It cannot be emphasized enough how important proper socialization is to ensure your puppy lives the best possible life they can. I absolutely love working with puppies as I know they will go on to live the best life they can. Yes it is true that we are more expensive than a group puppy training class. What is the advantage of coming to see us you ask. I work with some of the worst problem behaviours imaginable. I get to see over and over again where things went wrong. These dogs all started off as good puppies but at certain times in their lives the wrong step was taken. I can show you what these wrong steps are and how to avoid them. It is puppy season and I am very excited. We already have a lot of puppies coming this month and the next. If you want to learn how to have the perfect dog for you then give us a call and we will set you on the right path.